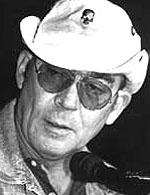 Police report of death scene reveals gonzo journalist's "rosebud"
MARCH 7--For all you Hunter S. Thompson completists out there, here's the Pitkin County Sheriff's Office report detailing the police response to the author's February 20 suicide. According to cops, Thompson was found sitting upright in a chair at his desk by the kitchen stove. His chin was on his chest, blood was coming from his mouth, and splatter was visible on the stove and a counter. A handgun was on the floor near Thompson's right foot. Jackson Case: Boys Don't Lie?